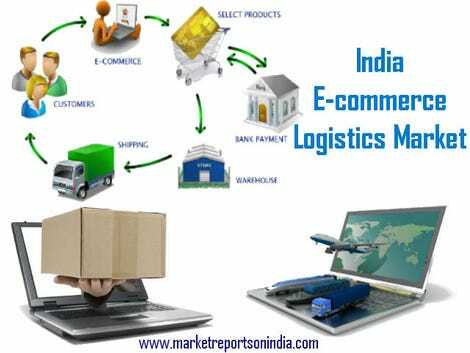 Market reports on India presents the latest report on “India E-commerce Logistics Market”. This report provide the customer base for e-Tailers wasn’t just restricted to the Metros. Indian e-Commerce market has seen a rapid growth in past few years. More than 70% of the e-Commerce market is travel related. The e-Tailing market has grown from $0.64 Billion in 2013 to $4.6 Billion in 2015 growing at a CAGR of 63%.The remaining comprises e-Tailing (online retailing), online financing and classifieds. Increasing internet and mobile penetration, growing acceptability of online payments and favourable demographics has provided the e-commerce sector in India the unique opportunity to companies connect with their customers. There would be over a five to seven fold increase in revenue generated through e-commerce as compared to last year with all branded apparel, accessories, jewellery, gifts, footwear are available at a cheaper rates and delivered at the doorstep. Out of 8 e-Commerce unicorns from India, 3 are e-Tailers (Flipkart, Snapdeal, Shopclues). The unprecedented rise in the e-Tailing market led to rise in demand of e-Commerce Logistics. According to ‘Indian e-Commerce Logistics Market Outlook 2021’, the customer base for e-Tailers wasn’t just restricted to the Metros. Almost half of the orders were from Tier 2 and Tier 3 cities. Generally all the Logistics Service Providers have a great reach and give timely deliveries in metros but, with this expanding customer base, timely delivery to such regions became a necessity. Logistics isn’t just an issue for bigger players but it is a bigger issue for smaller and up-coming start-ups. Finding a perfect logistics partner with a great reach across the country, COD facility and timely remittance and all this at a lesser price became one of the primary objectives for all the e-Tailers. A delay in delivery just adds to the dismay of the customer. The big e-Tailers like Flipkart, Amazon, Jabong, and FirstCry went for developing in-house Captive Logistics arm eg. Ekart of Flipkart, Amazon’s Amazon Transportation Services Pvt. Ltd., GoJavas of Jabong, XpressBees of FirstCry etc. Many start-ups have entered into the logistics market in past few years offering e-Commerce focused logistics solution, Delhivery, Ecom Express and GoJavas, to name a few. The traditional LSPs like Blue Dart, FedEx, Gati, India Post, Safexpress etc. have also come up with their e-Commerce focused logistics solutions. In coming years this market is going to rise as with the increase in the e-Tailing market aided by internet and Smartphone penetration in India, and to cease the opportunity many new players will enter the market with their offerings for e-Tailers. • COD Scenario, Returns, Reverse Logistics etc. • Company profiles of leading players and overview of start-ups. • Strategic Recommendations for e-Tailers, Traditional Logistics Service Providers, Captive Arms/E-commerce Focused Companies.